This week we've got a little change of pace from adventure modules. 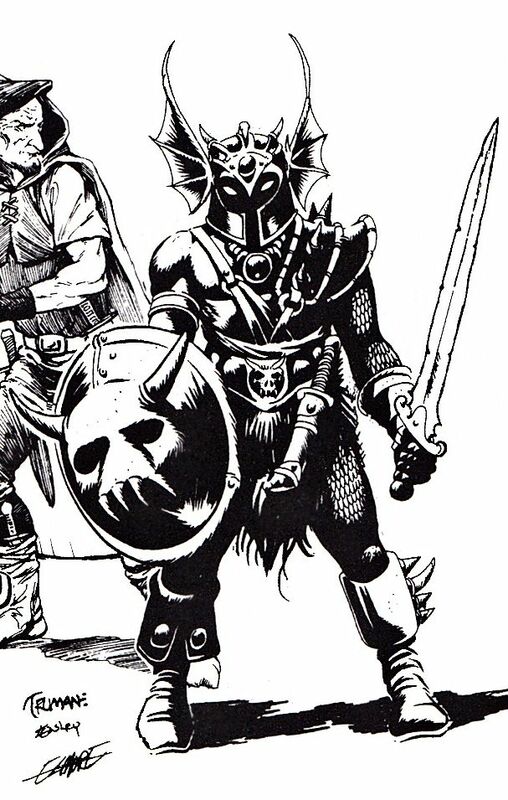 Starting in 1983 TSR published a series of 'Game Accessories' that ran the gamut from character sheets and Dungeon Master screens to collections of spells and magic items. Today we've got the first of these, AC1: The Shady Dragon Inn, written by Carl Smith. As the cover advertises, this is primarily a collection of pregenerated characters for use in your campaign. 73 of the characters are humans, divided between the four human character classes and another 32 are split up between the demihuman classes (remember, this is the D&D ruleset, so dwarf, halfling, and elf are classes as well as races). Each character is presented with a name, stat block including attribute scores, alignment, level, saving throws, and hit points, height and weight, armor and weapons, spells known (if applicable), and a short biography. There's also a lineup for each character class drawn by Jim Holloway. 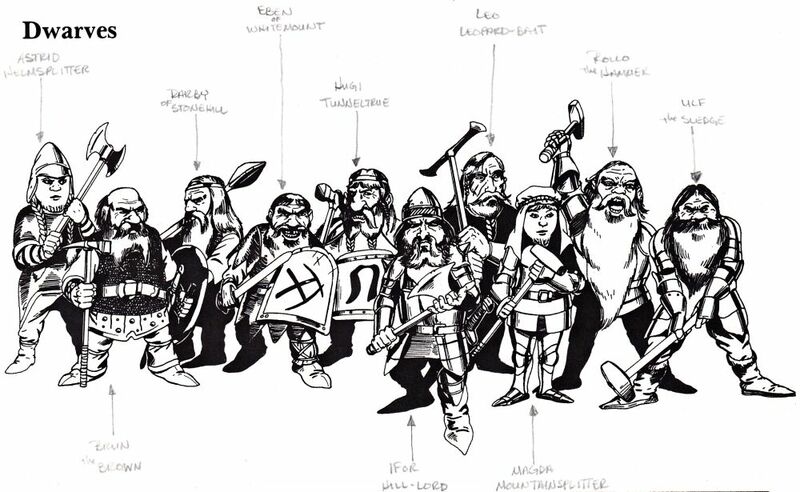 Of note, the dwarf lineup includes two dwarf women, both of whom have short beards. So as of this product, dwarven women in Basic D&D are bearded. Characters range in level from 1 to 14, which was the limit of what the rules supported at this point. Each one only gets a paragraph of description, but that generally includes a couple of interesting personality traits or bits of history to make them stand out. For instance the dwarf Leo Leopard-Bait "hates wealthy men" and "kicks cats when he gets the chance." Zarkon the Blue "brags too much, and sometimes makes promises he cannot keep." It's enough to make each character distinct and to give a good DM something to build on when using them as NPCs. 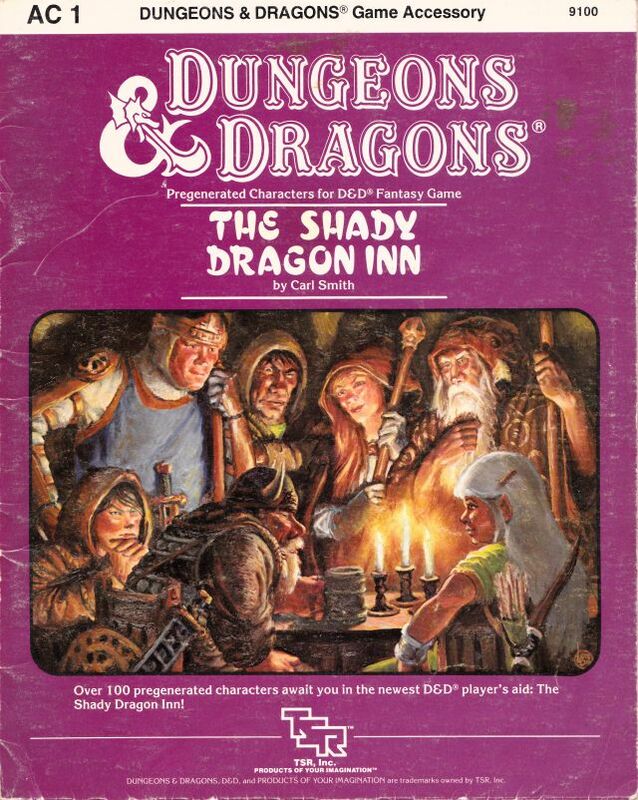 The Shady Dragon Inn itself is also presented as a foldout map sized for use with miniatures. Handy if you plan to use the inn as a base of operations for the PCs, especially if the odd tavern brawl breaks out on occasion. A short description gives a rundown of the owner and employees (all drawn from the pregens), prices, and the general state of the inn. Again, it's fairly terse but enough to serve as a base to build on. Finally, there are a few more characters presented here that I haven't mentioned yet, under the heading 'Special Characters.' In 1983 a licensed line of action figures hit the shelves; although the figures were marketed as Advanced Dungeons & Dragons, D&D stats for them (including a few characters whose figures were never produced) are presented here. Most importantly this means we have D&D stats for the evil WARDUKE. name always be printed in all caps. As far as the development of Mystara, nothing here really contributes to the setting. Some of the characters do show up as pregens in future adventure modules; I know that X6: Quagmire! is one of those. Apart from that none of them enter into the ongoing setting that I know of. The Shady Dragon Inn does make an appearance in the Tower of Doom arcade game in a town in Darokin. That's as close as it comes to being made canon in the setting. This is an accessory I really wish I had had when I was running D&D regularly. Coming up with NPCs on the fly, especially good names for NPCs, has always given trouble so a list of ready made characters to fall back on would have been useful. There are quite a few in here that I'd love to use in a game some time in the future.